Melt chocolate and shortening over a double boiler, stirring to melt. I use a small saucepan, boil water, reduce heat to low and place a heat proof bowl over the saucepan then add my chocolate, stirring until melted. Dip each graham cracker into chocolate and let set up on wax or parchment paper. Stick in the freezer for a few minutes to speed this up. 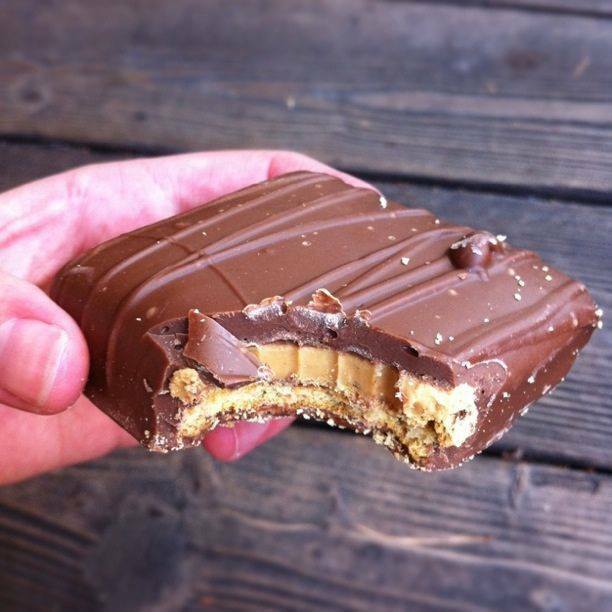 Spread 2 tablespoons (or a cookie scoopful) of peanut butter over the top of each dipped graham cracker then place in the freezer for 10 more minutes. This step is important. While the peanut butter is freezing, remove chocolate from heat and stir, so it cools slightly and thickens up a touch. Slowly and carefully spoon melted chocolate over tops and sides of peanut butter. This is where the patience and work comes in. Use a small spoon working the chocolate around the edges and sides. You’ll then use a little plastic knife to run the chocolate around the edges and clean it up a little. Let set up, (stick back in the freezer for another 10 minutes) then with a spoon, drizzle chocolate over top to get the “lines” you see in the pictures above. (If your chocolate is too thick at this point, set it back over the double boiler so it melts a little bit). My reviews…Definitely keep these chilled just like Disneyland does, they melt rather quickly once your fingers get on them. It was tricky to get mine to look quite as pretty as the Disneyland ones, but with a little patience you can do it! Have fun and keep them chilled!